Hello! 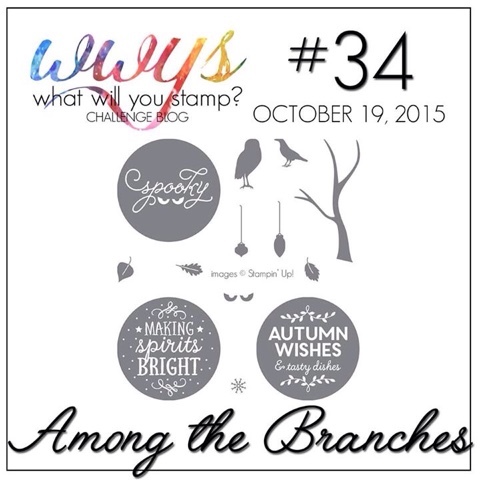 It's Monday again and that means it is time for the What Will You Stamp Challenge! This week's challenge is Among the Branches. I chose to use the most "Christmas-y" sentiment. I like it because it really doesn't have to be used for Christmas, it can be used to make a beautiful holiday card. This is great when you need to send a card to someone who doesn't celebrate the holidays, or, celebrates a different holiday than you do. I did choose traditional Christmas colors for this card mostly because I was dying to use that fancy foil vellum you see on the background of my card. My card this week is pretty simple and just incorporates lots of layering and the use of some beautiful Stampin' Up! products. Here's a close-up so you can see my layers more easily. I've got the foil vellum with the trees, then a circle of Red Foil (this foil is thick and sturdy!) that was paper pierced around the edges for some detail. 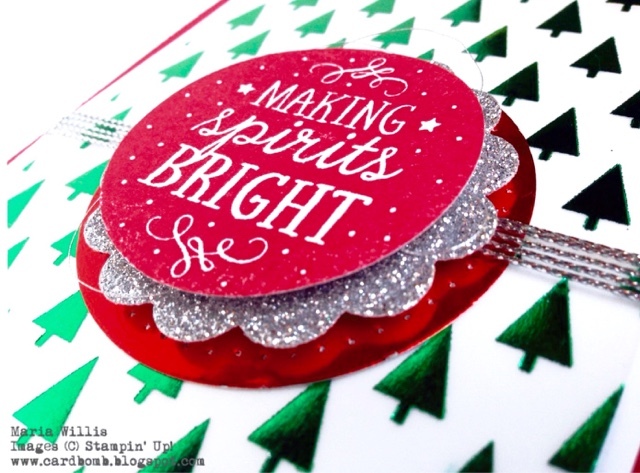 Then I wrapped the new Silver Cording Trim around the card face five times and topped that off with Silver Glimmer paper, Silver Metallic Thread and my sentiment stamped in Real Red on Whisper White. I popped almost every layer out with dimensionals...keeping things fancy, ya know! And that is it for today! 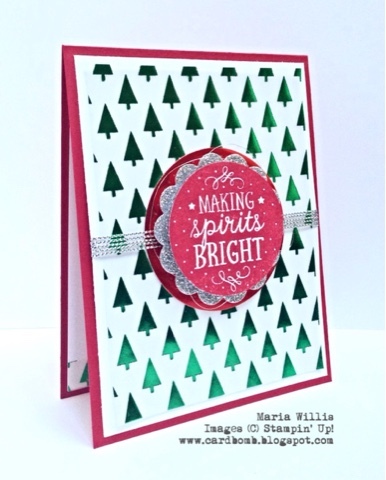 A simple card that is stepped up with fancy paper and lots of dimensionals-I hope you liked it! Here's what the whole stamp set looks like. The rest of the stamps are for fall or Halloween and are great for building woods scenes. Don't forget to head on over to the What Will You Stamp Challenge Blog to check out what the rest of the WWYS Design Team has made this week! They're all such a talented crew that I can't wait to go check out their projects myself. If you have this stamp set we would love to have you play along with us this week! Simply submit your card or project to the WWYS Blog and earn your shot at being our guest designer in a future challenge! Thanks for stopping by and checkin out my project this week!